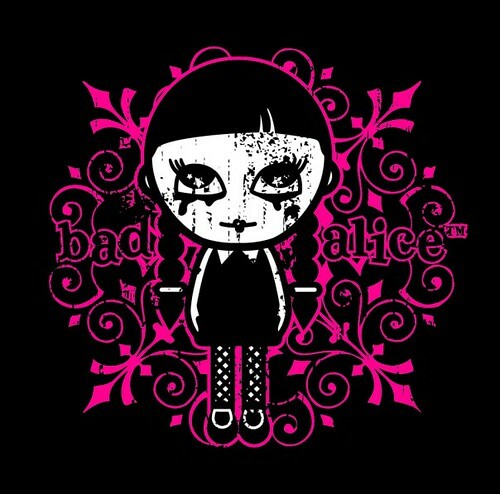 Bad Alice is a character I developed whilst working for Hip Designs back in 2003. The brief was for a goth style girl character that would appeal to a tween market. I was specifically asked to design something that had a similar feel to Emily The Strange, but with a younger, more commercial and parent friendly feel. From small beginnings, Bad Alice has now seen worldwide success and can be seen across many varying product ranges including apparel, stationery, gift ware and home ware. In her first year down under, Bad Alice outsold Star Wars products in Target stores across Australia – Way. The Princess of Thailand once bought a Bad Alice bag at the Parragon Centre in Bangkok! 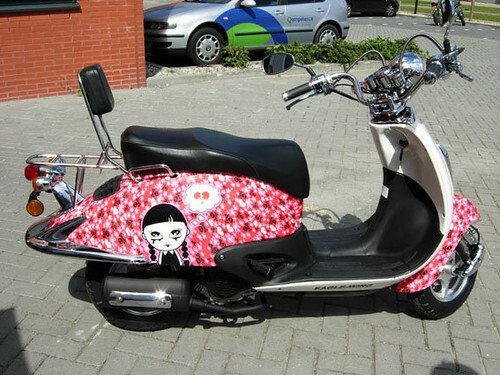 The arrival of the first batch of Bad Alice scooters currently being sold in the Netherlands… …whatever next? For the full lowdown, check out the official site here. Pictures of the Bad Alice stand at the Licensing show can be found here. I got your details from my other half, Maria Bowers. We have met briefly. Do you still do illustration?